The discovery of a new species is always exciting news in the biological world. But how do scientists fit a newly discovered species into the established ‘tree of life’? How do they know that an organism truly is a ‘new’ species? And why do some species get reclassified over time? To answer these questions, we need to understand the basics of ‘taxonomy‘. Developed by Swedish scientist Carolus Linnaeus in the 18th Century, taxonomy categorises all living entities in a hierarchical structure by organising species into taxonomic groups, or ‘taxa’ (see the figure to the right). Following this classification system, organisms are assigned a two-part scientific name, known as a ‘binomial nomenclature’. The first part of the scientific name designates the ‘genus’ of the organism; a group which may encompass multiple species. The second part of the name identifies the organism’s species name. Taxonomy and binomial nomenclature are a universal classification system that allows scientists across the world to identify exactly which kind of organism is being discussed. Scientific names are used because common names may be influenced by local factors like physical appearance and geographical location and can be different in different countries. In recent years, we have seen changes in many scientific names as a result of scientific advancement. This includes a number of ClimateWatch bird, reptile and marine species. So why all these changes? In the past, new species have often been ‘fit’ into the taxonomic system using simple observations of shared physical characteristics, or ‘phenotypes’. Due to recent technological advances, the scientific community has more recently begun categorising species by DNA rather than physical similarities. These genetic characteristics are referred to as a species’ ‘genotype’.This method allows for a better understanding of the species and its relationship with others in the genus. The Australian Water Dragon provides a good example of this shift in classification methods. The Australian Water Dragon used to be known as Physignathus lesueurii, as it looks quite similar to the Asian Green Water Dragon (Physignathus cocincinus). Physignathus translates to ‘puff-cheek’, a physical characteristic the two species shared in common, while the species name lesueurii comes from the French naturalist Charles-Alexandre Lesueur, who collected this species in 1800. In 2012 however, DNA testing revealed that this native reptile has enough unique characteristics to be classified within its own genus. It is now known as Intellagama lesueurii. The Australian Water Dragon (Image: Scope, Channel Ten). For plant species, reclassifying particular flora has also led to breeding opportunities. The Hibiscus syriacus was previously known as Althea in the genus Mallow. Since the reclassification of the genus from Mallow to Hibiscus based on DNA sequence, the Hibiscus syriacus has been bred with others from its genus which resulted in a dazzling new species known as Hibiscus tosca. Several ClimateWatch species have undergone similar name changes as a result of DNA sequencing and other scientific research. For example, Cuckoos have had a genus change from Chrysococcyx to Chalcites, reflecting current Australian bird taxonomy. 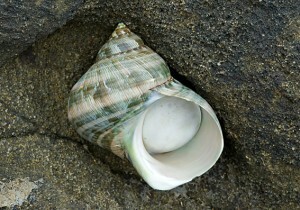 Several molluscs have also had their scientific names changed; the Blue Periwinkle, now known as the Austrolittorina unifasciata, was formerly from the Nodilittorina genus. The scientific names of some other ClimateWatch species reveal romantic ideas about the animals themselves. For example, The Sugar Glider’s scientific name is Petaurus breviceps, where Petaurus translates to ‘rope dancer’, and breviceps means ‘short-headed’. The Military Turban snail (Turbo militaris) is a species of the Turbo genus, which encompasses large sea snails that can reach 15cm long. Turbo comes from the latin word for ‘spinning top’. Another example of unusual binomial nomenclature taxonomy is the vampire squid (Vampiroteuthis infernalis) whose name translates loosely to ‘vampire squid from hell’. Or take the famous giant squid, (Architeuthis dux), whose scientific name translates to ‘Archduke of Squid’. You can find some other great scientific names here and here.